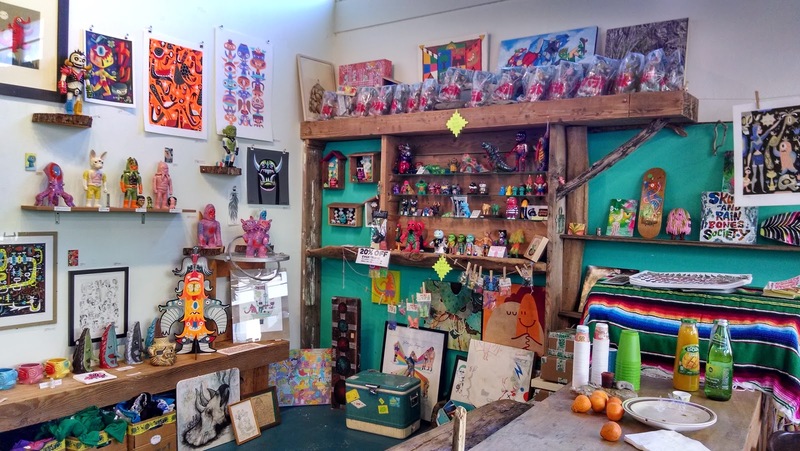 Grasshut Corp's brick-and-mortar location in Old Town Portland is closing. I understand Bwana's reasons for doing so, but I will miss it none the less. The last show featured Grasshut stalwarts Tim Biskup and Miles Nielsen. Sorry for the radio silence, I should have some new pretty pictures to show you, and some new customs in the store! It's been a rough year for me on many fronts, but I feel like I'm finally making progress again, not least of which getting my workshop/storage space organized. 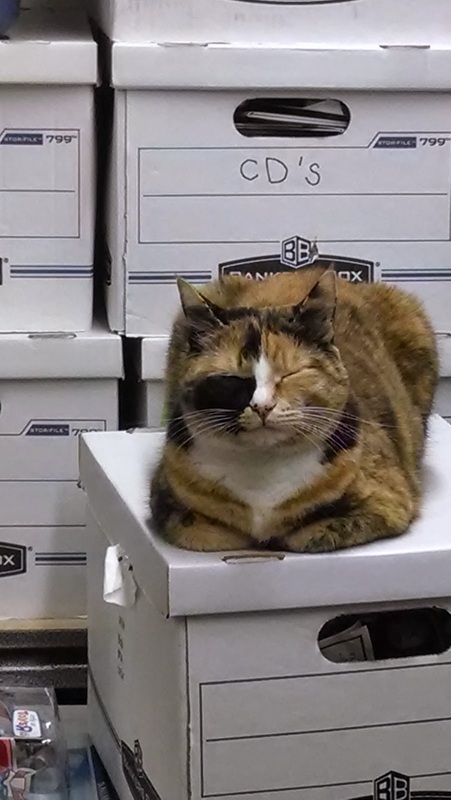 Maggie Approves! Poodra is one of five new micro kaiju figures Mark Nagata launched last year, under the new Monster Boogie banner. Large for micros they're around 3" tall. Poodra is a hefty little chunk of vinyl. I took me a long time to warm to the sculpt. Just something about it wasn't clicking. It took me a couple test schemes before I settled on 'Happy Fun' Poodra here. 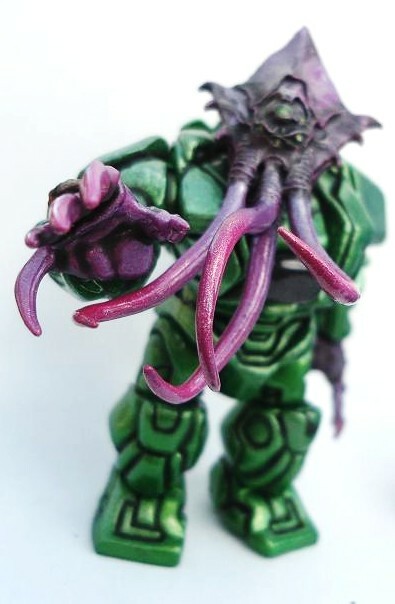 My paintjob still lacked personality until I started on the pupils in his eyes. That finally sold the crazy mutant puppy for me. Unusual too is that I avoided metallic and special effects paints. He's just covered in bright, bold monster color, and given a basic satin acrylic varnish. The scheme is based on vague recollections of McDonald-Land commercials, and other 70's vestiges that slouched into my childhood, and seared themselves on my brain. Take Poodra home, won't you? Thank you! Dealing with stuff isn't fun! I'm being let go from my job soon. Bad news for income, probably good news for most other aspects of my life! Also finishing up a brand new workshop with my Father. It's going to fantastic. In the meantime though, I've barely been painting (Monster Boogie Mecha Nekoron commission above, one of the few things I've finished in the last couple months). That will change soon! Much more new stuff to come! Secret project is still secret, but hopefully revealed soon! Thanks for stopping by, more soon. Head over to the TAG Creature Feature page for pictures of their latest show, featuring two of my favorites, Elegab and Munktiki! Along with the fantastic Munktiki ceramic pieces, this is Miles' first Sofubi! I had to get one, you should too. Orbit Zenith Man flopped. Will I finally learn that presentation is everything on the internet? That packaging is important? That when I say I'm doing an Uzay Blue Stars homage, it should look like Uzay Blue Stars? Maybe! The OZM exit the store, their return TBD. In the meantime, there are many irons in the fire at Orbit HQ! Several commissions are in various stages of completion, I've got a whole pile of sofubi I want to paint, some huge Glyos customs on the workbench, and the Secret Project moves on to phase 2! Hopefully you will be hearing more about that one very soon now. Stay tuned for more transmissions from out broken satellite. Hit the store link, Orbit Zenith Man is for sale! Run of three, deluxe drop, with packaging (extra bootleggy box top above). The store wasn't adding anything to the cart last night, because I'm that good at ctrl-v ctrl-c. Should be fixed now! Orbit Zenith Man is an homage to one of the most sought-after Star Wars toy bootlegs of all time, the infamous Turkish Uzay Blue Stars. Why Hasbro hasn't done their own homage, I don't know. Why Hasbro hasn't simply churned out oddly-colored Clones and Stormtroopers, I don't know either. I'd buy tons! But, they did the DIY crowd a huge favor by releasing 12" limited articulation clone troopers. A neat, durable toy for kids, and a fun plaything for painters! Of course I intended the first run of Orbit Zenith Men to be solid blue, with a white weapon, but being the amazing planner that I am, I ran out solid blue. Hence, Edition One is all metallic colors, since I have plenty of those. I'll do a more traditional solid scheme next if these sell through. The metallic looks incredible though, I can't help but gawk at them on my shelf. Everything is still on track for release tomorrow! Get ready for the first Orbitdyne Deluxe Drop! Orbit Zenith Man - Edition One will go on sale Friday March 22nd at 6:00 Pacific Time! Three pieces, lovingly covered in dazzling metallic blue Monsterkolor. Each piece will be $65, shipping included to the US ($75 International). This will be a complete, packaged release, with custom boxes and everything! Stay tuned for more pictures, and details on the figures themselves. Behold! Dictator of Space: Lord Bozyk (named after a secret sandwich at my favorite place to eat.) You saw the WIP picture in this post. But here's the finished item! This guy was a commission in trade for some hard-to-get Glyos figures. The head is from a pewter miniature, the hands were stolen from an action figure. 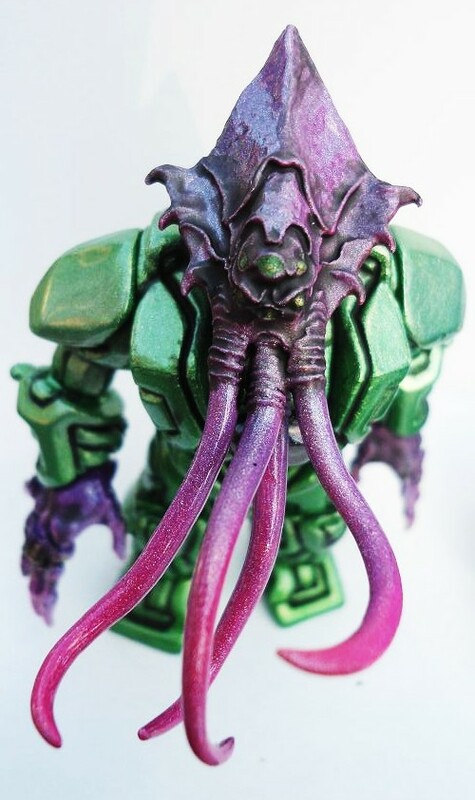 I did some sculpting to make the pieces fit the body, and painted it with my favorite Monster Kolor Metallic - Green Tea. He also features a bunch of special MK pearls, Vividtone. and Color Change flakes to top it off. After the ultragloss clear set, I highlighted the details with some flat acrylic wash. Unfortunately for the recipient, I came down with the flu in between the start and end of this project, but fortunately for me, he was incredibly patient. I added the Jeweltone crayboth (from an earlier custom project) as a bonus. 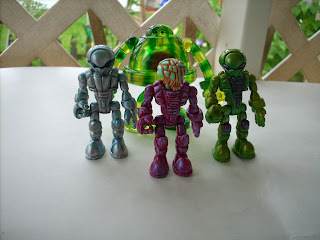 The recipient is a prolific Glyos customizer as well, check out his shop here: http://ersico.storenvy.com/ Thanks to Eric as well for the pictures! Edition of three, sale date and more information coming soon! Finally getting back to work. Above is one of my shamefully late commissions, a custom Glyos Armorvor. 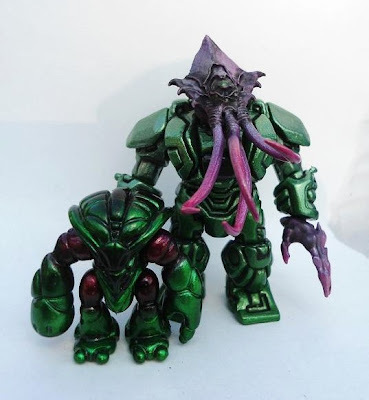 Another super-awesome thing about working with Glyos? The extra pieces make their own paint stands. Still needs clearcoat, and some hand-brushing to bring out details. The head is from a pewter miniature, the hands are from a Green Lantern figure. My workbench lies depressingly fallow. Between the gloomy winter, and debilitating flu, I've gotten nothing done in the last several months. February was especially rough. I suffer from clinical depression already, additional depression isn't welcome. I'm shamefully behind on several commissions, and a big Secret Project. I don't lack for projects or ideas, but I do lack health, energy, and time. But it's March now! March will be much better! I will make it better. One last Max Toy glow-in-the-dark figure. Captain Max is the superhero mascot of Max Toy co, presented in mini form, he's tiny and cute. Almost micro size at under 3" (the boundaries of the definition are vague and flexible) with plenty of detailing on his costume. I decided to use some masking to create negative space on his eyes and ears. I often completely fail at masking, either not masking enough, and overspraying, or peeling the paint below when I pull the mask off, or letting the mask slip while I paint. I managed to avoid all those here, probably because the masks were simple, and the piece is very small. Monster Kolor C-thru at bat once again, and not disappointing. Violet, Bad-apple red, orange, and yellow for the fade from the center out. No pearls or special effects paints, just gloss coat to finish. I figured the glow and colors were vibrant enough. He glows like a little champ, and I'm happy with the finished product. No mini captain max minis available at the moment, but full-size figures are in Mark's store! Here's Drazorus glow-in-the-dark twin, Dragigus. Baragon with a lobster tail? That'll do! 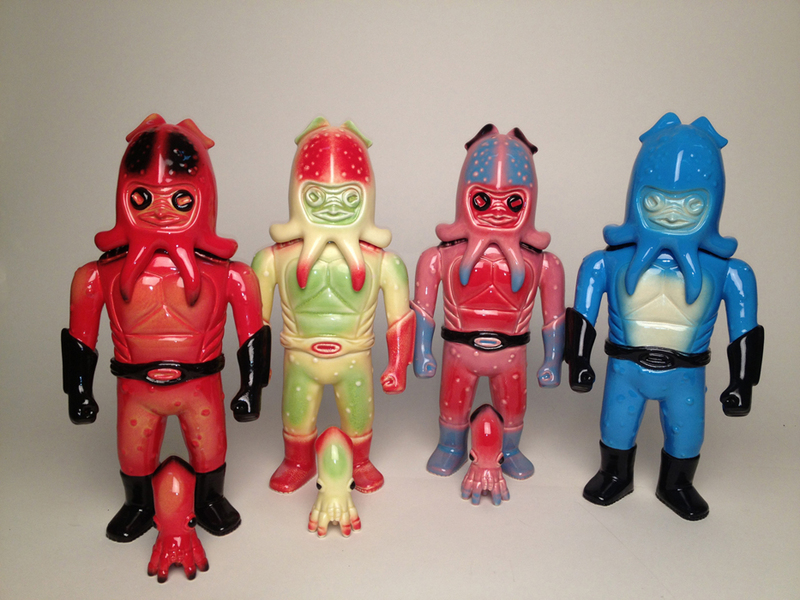 Another fine Max Toy Co design, from Mark Nagata. I went in intending to do a swampy green and purple scheme. It didn't really come out that way; I'm especially disappointed with how the green stripe on his back just stops at his neck. It's not one of my better efforts, that. I think I didn't want the green overspraying the purple and darkening too much. I probably should have left off the pink, and definitely the yellow. Swap the pink for a different shade of purple, and he's back to being a swamp creature. Dump the yellow, and he no longer looks like holiday candy. A bright lime green would have worked better, but I don't have one of those in a clear paint. There's a rant on public perceptions of certain color combinations in there somewhere, but I'll spare you. Monster Kolor C-Thru does the heavy lifting again, and a coat of white pearl metallic gives him a fantastic glazed pottery look. 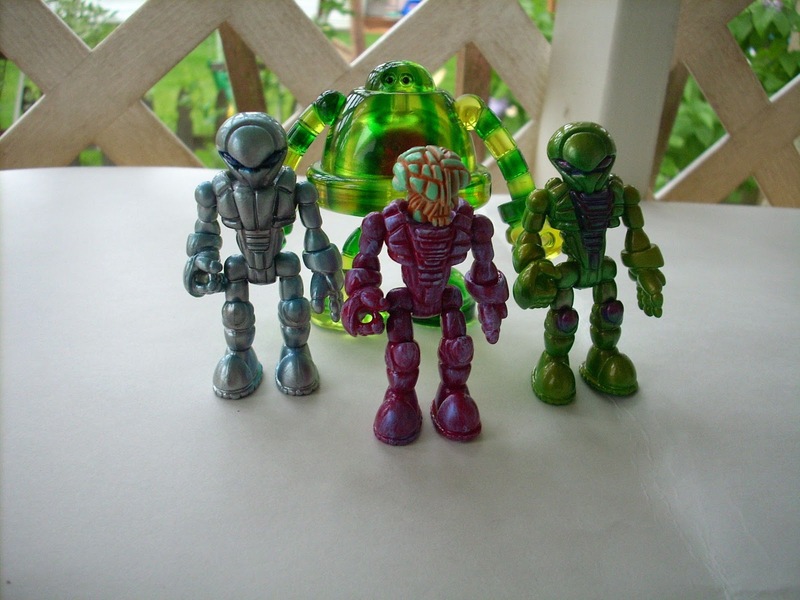 The sheen is nice an visible in the group shot below, hanging with more of the Max Toy Mini family. If you want on of your own, there's a brilliantly painted Mt. Kubo variant available in the Max Toy Co store. 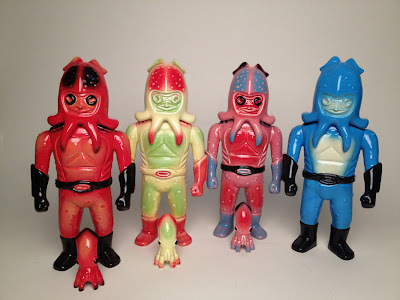 Max Toy Co, brainchild of Mark Nagata, was my first introduction into the world of real Japanese Kaiju figures, his mini figures will always have a special place in my heart, and they're always a joy to paint. Above is one of my favorites, Drazorus, part of an unpainted glow-in-the-dark pair (with his buddy Dragius) offered a year or two ago. They don't show up nearly often enough for liking, I want more! Drazorus is another fascinating sculpt, with lots of spikes and armor plates. I am incapable of completely painting over a glow in the dark figure, which meant deploying the Monster Kolor C-thru! 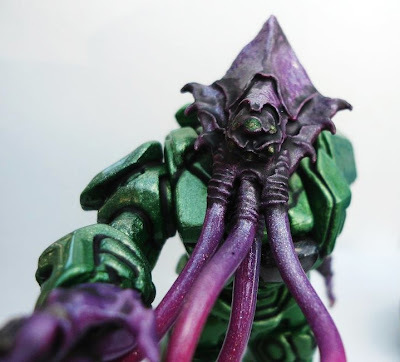 A little C-thru paints go a long way, and it can be very easy to overdo it, which is my way. I think I was able to pull back enough to give him a nice amount of color, without going overboard. The spikes, claws, and armor made me think 'lobster monster' and I ran with that, with some magma colors for a fiery effect. He's finished with Monster Kolor White Pearl for a little of sparkle, and ultragloss coat. The result is one of my favorite schemes, and he lives in my permanent Max Toy Co collection. If you want your own Drazorus, there's a really cool painted variant in the Max Toy store right now!